Figure 1. 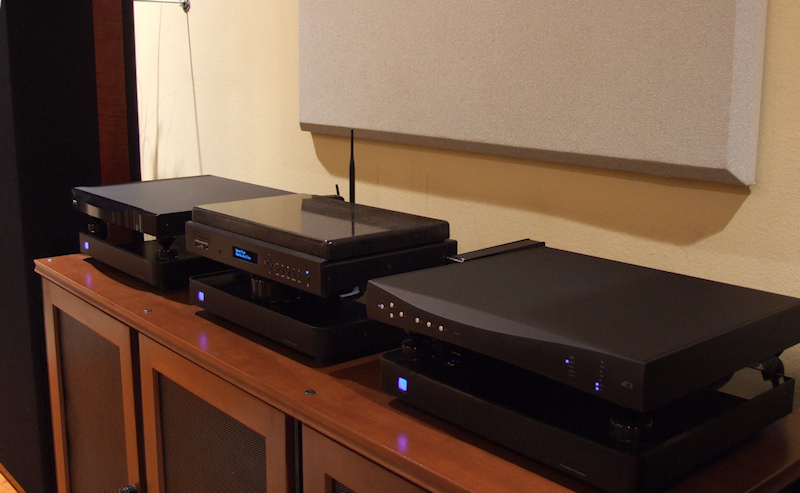 The digital trinity: dCS Puccini U-Clock master cloce, Bryaton BDP-2 digital player, dCS Debussy DAC. The diskless life keeps getting better. I recently completed a conversion of all PMC FLAC format music files to DSD (direct stream digital) format. DSD is the format used to encode SACD discs. My motivation for this project was not better sound quality, although that was an unexpected benefit. My motivation was convenience. to reduce the locking time. to lock, so you have 2 delays in your system. The USB interface is primarily intended for connection to a PC. capacity to add a delay." My Bryston BDP-2 digital player does not have the capability of adding gaps between songs. The workaround I used was to make silent files of 2 seconds for every sample rate in my music collection. When making playlists, the appropriate "gap file" was inserted where needed. This was cumbersome, but effective. My playlists typically have a mix of FLAC files of different sample rates and DSD. The 2 second length was arrived at by trial and error. 1. JRiver Media Center ($50) - sample rate conversion and format conversion tools are part of this digital player's features. 3. TASCAM HiRes Editor (Free). VinylStudio's support for DSD is to allow you to record from devices that support it, and, if desired, to convert the resulting file to PCM." "Our recommended maximum sample rate for all vinyl phono or Analog inputs that do not exceed a usable input bandwidth of 48kHz, is 96kHz. As there is no usable information on a vinyl LP above30kHz, it will always sound preferable to restrict the maximum output sample rate to 96kHz." At the beginning of my vinyl ripping project, I experimented with 96k, 176.4k, 192k, and DSD64, and I obtained the most natural and detailed sound with the best spatial properties as I went up in sampling rate. 1. 44.1k/16 bit FLAC files produced DSD64 files 4 times larger. 2. 88.2k/24 bit FLAC files produced DSD64 files 2.11 times larger. 3. 96k/24 bit FLAC files produced DSD64 files 1.89 times. 4. 176.4k/24 bit FLAC files produced DSD64 files 0.7 times smaller. 5. 192k/24 bit FLAC files produced DSD64 files 1.18 times larger. The bit rates of PCM and DSD are not directly comparable. While it is true that a higher PCM sampling rate can capture more information than a lower PCM rate, you can't say that a two chanel PCM sampling rate of 192k/24 bits (9.216 megabits-per-second) can capture more information than a two channel DSD64 sampling rate of 5.6448 megabits-per-second. DSD samples are not the same as PCM samples. PCM encodes information by varying the amplitude of the sample in proportion to the amplitude of the analog signal. DSD encodes information by varying the energy density of the sample in proportion to the amplitude of the analog signal, while maintaining a constant amplitude for each sample. In this way, comparing a PCM sample is somewhat analogous to comparing a two dimensional picture of an object to the actual three dimensional object. When I began research for this project, I was not aware that there was a rancorous "PCM vs. DSD" debate similar to other audiophile/anti-audiophile debates such as "tubes vs. transistors", "sighted vs. blind testing", and "stereo vs. mono". other convincing explanation for the effect. Dithering is the process of adding high frequency white noise to a digital signal in order to "fill in" the spaces between samples and "fill in" the spaces between the actual analog value and the rounded off digital value. While it's true that the human ear can't "hear" ultra-sonic noise, the effects of ultra-sonic noise can be sensed by the ear, just as infra-sonic ( below 20 Hz) sound can't be "heard", but can be sensed (felt) consciously and subconsciously by the ear and body. Very nice and very interesting write up Raife. Not sure how I missed this thread when you posted it. other convincing explanation for the effect........"
;to say that it shows how much "hooey" we audiophiles are full of because even the Upsampler manufacturer (dCS) could not scientifically explain why the separate upsampling equipment used could cause the improved sound quality. "Dithering is the process of adding high frequency white noise to a digital signal in order to "fill in" the spaces between samples and "fill in" the spaces between the actual analog value and the rounded off digital value. While it's true that the human ear can't "hear" ultra-sonic noise, the effects of ultra-sonic noise can be sensed by the ear, just as infra-sonic ( below 20 Hz) sound can't be "heard", but can be sensed (felt) consciously and subconsciously by the ear and body."